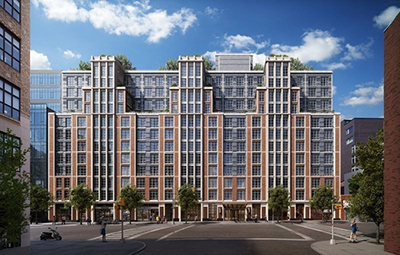 Manhattan, NY Leading the way in new residential development patterns westward from SoHo’s Broadway shopping district, 261 Hudson is an representation of classic-meets-contemporary architecture in the West SoHo neighborhood. The Robert A.M Stern designed and Related Companies developed the residential building, which keeps the historic aesthetic of the neighborhood alive by espousing pre-war architectural elements. As more developments attract residents who have safety on their minds, security and communications systems become a marketable component for management companies looking to draw new renters. Attracting tenants to apartment buildings such as 261 Hudson means not only having fitness centers, sun lounges and technology centers but also that every unit and common area is secured with an online network that monitors the building 24/7/365.